The discourse across my Twitter timeline these days has been centered around mental health resources – a slew of hotline numbers, critiques over lack of funding for important organizations, and the sharing of quotes and details in memory of those who’ve passed. We see this behavior in the wake of any tragedy; a world-wide wake across social media platforms for those who were unable to make it to the funeral, but still had information and opinions to share. So few of us on the internet directly knew the celebrities who took their own lives recently. We idolized their lifestyles, saw the fruits of their work and, while we had never met them personally, we are grieving their loss. Their deaths, however, triggered a larger conversation on suicide prevention, warnings signs, and access to mental healthcare. The topic of mental health is still one we tend to skirt around – though, socially, we are slowly making strides. Many celebrities have opened up about their own experiences as a way to normalize the conversation, one of the most notable being Demi Lovato, a singer and Disney alum, who spoke openly about her struggles with addiction, bipolar disorder, and ongoing eating disorder in her recent documentary titled Simply Complicated. Her interviews are candid and, as someone who grew up watching the Disney Channel, it was jarring to hear her story. I remember the headlines that would cover teen magazines like J-14and Tigerbeathinting at these details (the debate between cutting or hair tie imprints, altercations with a backup dancer, etc. ), but they were often dismissed as rumors or cheap gossip. The truth, however, was both humanizing and complex: here’s someone whose story matches that of countless others quietly suffering, whose openness inspired others to seek help. But we learned recently that her uphill battle continues, another reminder that there is always more to a person and story than what is often seen. Our hearts genuinely go out to Demi as she recovers, but I’m also aware that she is a celebrity, someone who is able to access and afford services if she chooses to seek them out, a privilege that is not given to most individuals who might need the support. Finances are one of the many barriers that might hinder someone from getting the help they need. And when it comes to the Muslim community, culture and fear can play a big part as well. [Please note that I am not a clinician; I am the first point of contact for anyone who comes to the center. I help manage client intake procedures, work closely with the therapists on our team, and assist in our data collection and research]. 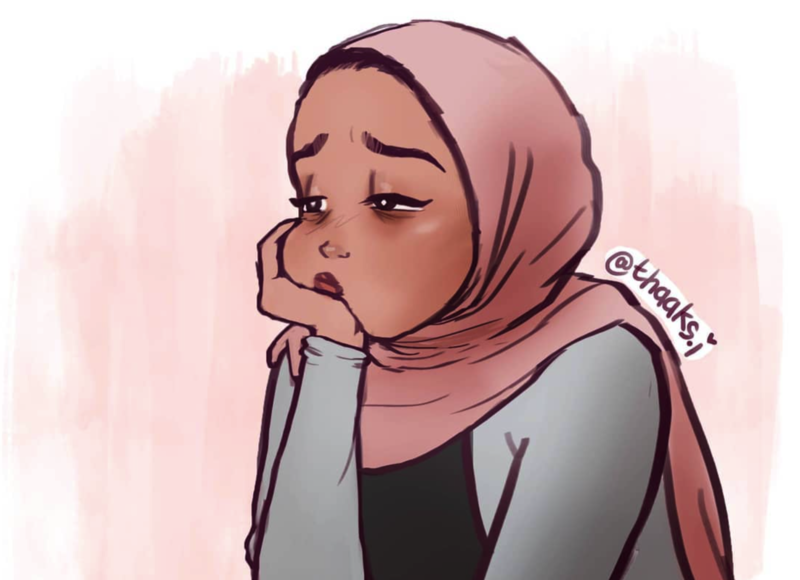 Most people – Muslim or otherwise – were raised in communities with negative views regarding mental health struggles and care that fuel the stigma we see today. Those with mental illnesses were often labeled crazy, ungrateful, or lazy depending on their symptoms, or were told to ‘pray it away,’ but rarely received actual clinical support. And as the victims of these toxic ideas gotten older, it’s become more difficult for them to stray from these stigmas and seek out services. Most services are offered in English and for people coming from other countries (immigrants, refugees), they aren’t able to find a clinician they can communicate with. These families also typically have an increased need for mental health resources, given that “the often traumatic reasons for leaving the host country as well as the potentially long and hazardous journey and process of resettlement” can impact their mental well-being. At our office, we’re starting to see a spike in refugee clients, and despite having a diverse and mostly multilingual staff, there are still languages that our clinicians don’t know or know enough of to offer therapy in that language. In other offices, language might be a bigger barrier, especially if most of the staff is white. Sessions can be costly, not all insurances are accepted, and not everyone has insurance. Out of pocket rates are high and those in lower income brackets may have a higher need for mental health resourcesas well, but often are unable to afford it, especially when it comes to culturally sensitive care. They might pick a clinician they can afford or is covered by their insurance over someone that might be a better fit. A common persuasion tactic: you are more likely to believe, trust, side with someone who shares one of the labels you identify with. In therapy, sharing a similar background makes it easier to build that relationship between client and clinician, so that the client feels comfortable enough to open up about their concerns. It also saves them from having to explain culture specific ideologies/behaviors to a therapist who does not share these experiences, keeping the focus of the session on the client instead of educating the therapist. This can come in many forms: general anxiety of coming to an appointment, paranoia that people will find out they need help, how it might affect their reputation in the community if other members knew. By law, records and patient information are meant to be kept private and confidential, but saying so isn’t always enough when it comes to the client’s nerves. “Log kya kahenge”? or ‘What would people say?’ tends to be a popular sentiment/topic of concern. Because of these barriers, it is not enough to offer a list of phone numbers and organizations that people could reach out to if they need support – the organizations must also offer ways to combat these areas of concern so that the available resources are actually accessible to those who need them most. As an individual, you can donate to local mental health resource centers so that they’re able to keep their doors open, hire more diverse staff, and help subsidize treatment for clients if possible. As with any other social issue, vote, vote votefor measures and candidates that support offering funding towards these types of programs as our current administration is depleting these budgets by the millions. And, as always, if you are struggling and need someone to talk to, I hope that you’re able to reach out to someone. Here is a list of Muslim friendly resources compiled by @theroguemuslimfor when you might need a little more support.